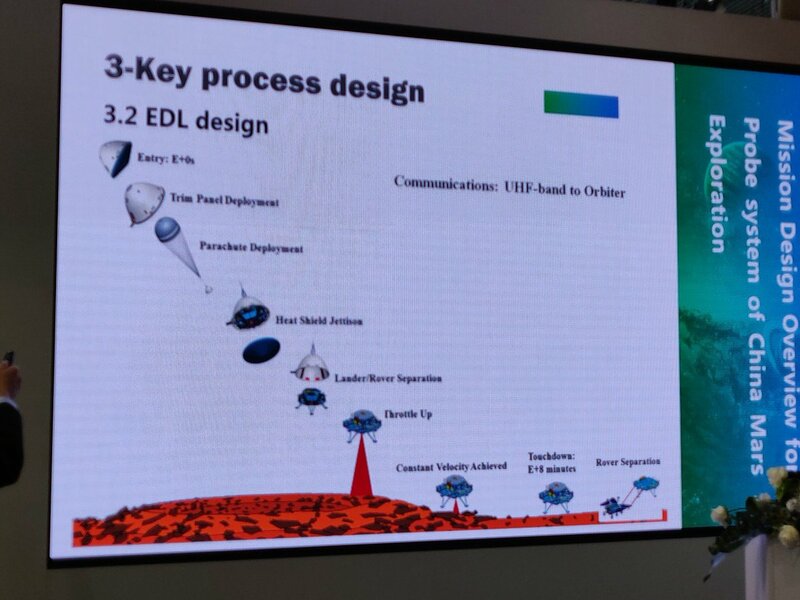 The landing will involve the use of blunt body aerodynamics, deployment of a supersonic parachute and powered descent to safely set the rover down on Mars. Part of the team that developed the Chang’e-3 lunar lander and rover, which successfully soft-landed on the Moon’s Mare Imbrium region in late 2013, is working on the mission, though Mars presents different and greater challenges: notably remoteness, more gravity, the presence of a thin atmosphere and less solar energy reaching the planet. According to a document seen by your correspondent, the landing ellipses—the areas in which the spacecraft is statistically likely to land—for China’s Mars mission will be around 100-by-20 kilometers, making it comparable to those for the joint ESA-Roscosmos ExoMars missions and NASA Mars Exploration Rovers, but considerably larger than the 20-by-7 kilometer landing footprint used by Curiosity in 2012. The 240 kilogram solar-powered rover is twice the mass of China’s lunar rovers and, according to academic papers authored by key figures involved in Chinese space exploration missions, slated to carry six payloads. These are a navigation and topography camera, a multispectral camera, a subsurface detection radar, a laser-induced breakdown spectroscopy instrument similar to Curiosity’s LIBS instrument, a Martian surface magnetic field detector, and a Mars climate detector. The orbiter will meanwhile be carrying seven payloads, including medium and high-resolution cameras (with the latter similar in capabilities to NASA's HiRISE), an ion and neutral particle analyzer, a magnetometer, subsurface detection radar, a mineral spectrum detector and an energetic particle analyzer. 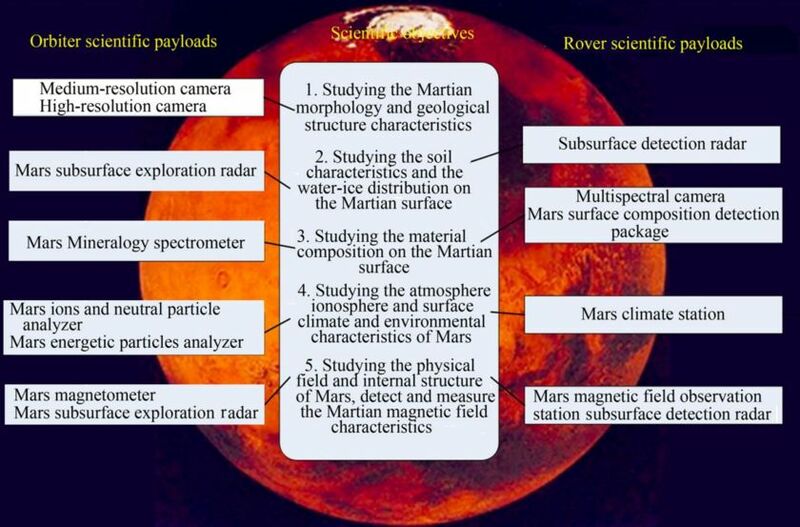 The instruments will be variously used for stated science goals of analysis of the Martian ionosphere and interplanetary environment, investigating the type, distribution and structure of Martian soil and the topographic characteristics of Mars. [JD1] [JA2] The subsurface detection radar will, in particular, be used to detect water and ice on the Martian surface and below. Chińczycy pokazali ilustrację z przedstawionym lądowaniem ich lądownika i łazika w 2021 roku. Oby się im udało, bo w ten sposób inni poczują trochę konkurencji. Np. : lądownik marsjański wszedł w fazę montażu i testowania, a łazik będzie miał masę ponad 200kg tj. będzie blisko dwukrotnie większy niż Yutu i będzie miał ulepszony mechanizm napędowy. Parafrazując: "Yutu 2 nie jedzie wolno, tylko dokładnie" bo musi wykonać po drodze badania (Sun Zezhou). Chang'e 5 jest gotowy do lotu. Ah Chińska misja marsjańska na 2020 ma swój wątek! Te informacje warto tam umieścić! Nie wiem czy to sensowne, bo podlinkowana informacja dotyczy nie tylko lądownika marsjańskiego, ale również Chang'e 4 z Yutu-2, Chang'e 5 i innych chińskich programów.